Swann's Revisal is the familiar name of the first book published in the colony of North Carolina. The book-whose partial official title was A Collection of All the Public Acts of Assembly, of the Province of North-Carolina: Now in Force and Use. Together with the Titles of all such Laws as are Obsolete, Expir'd, or Repeal'd.-was a compilation of all of the laws of North Carolina ever passed, whether still in force or not. It appeared in 1751 as a 338-page volume from the press of James Davis, who had only recently moved to New Bern from Williamsburg, Va., as the colony's first printer. Prior to that time, the session laws of the colony were copied by hand and available for those who needed them. Errors were sometimes made by an amanuensis during the copying procedure, and variant copies caused problems in court. Under Governor Gabriel Johnston in 1746, a three-man commission was named to compile the laws. One of them declined to serve while another, Edward Moseley, did some work on the collection but died before it was finished. Only Samuel Swann saw the task to its completion, and his name has been forever attached to the document. The book was bound in leather that in time yellowed, thereby providing its other nickname: "Yellow Jacket." This name might also have been suggested by someone who had been "stung" by newly revealed laws. Douglas C. McMurtrie, Eighteenth-Century North Carolina Imprints (1938). "SAMUEL SWANN." North Carolina Highway Historical Marker Program. http://www.ncmarkers.com/Markers.aspx?ct=ddl&sp=search&k=Markers&sv=D-52. 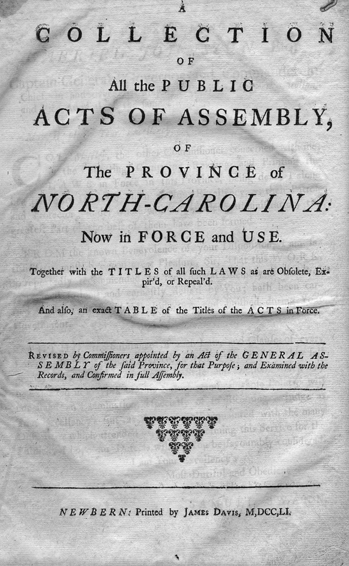 Title page of the first book published in the colony of North Carolina, a 1751 collection of all the laws that had been passed by the Assembly. North Carolina Collection, University of North Carolina at Chapel Hill Library.